"GTK" redirects here. For other uses, see GTK (disambiguation). GTK+ (formerly GIMP Toolkit) is a cross-platform widget toolkit for creating graphical user interfaces. It is licensed under the terms of the GNU Lesser General Public License, allowing both free and proprietary software to use it. It is one of the most popular toolkits for the Wayland and X11 windowing systems, along with Qt. The GTK+ library contains a set of graphical control elements (widgets), version 3.13.3 contains 203 active and 37 deprecated widgets. GTK+ is an object-oriented widget toolkit written in the C programming language; it uses GObject, that is the GLib object system, for the object orientation. While GTK+ is primarily targeted at windowing systems based upon X11 and Wayland, it works on other platforms, including Microsoft Windows (interfaced with the Windows API), and Mac OS X (interfaced with Quartz). There is also an HTML5 back-end called Broadway. GTK+ can be configured to change the look of the widgets drawn; this is done using different display engines. Several display engines exist which try to emulate the look of the native widgets on the platform in use. Starting with version 2.8, released in 2005, GTK+ began the transition to using Cairo to render the majority of its graphical control elements. Since GTK+ version 3.0, all the rendering is done using Cairo. In 2005 GTK+ 2.8 started utilizing Cairo to render the majority of its graphical control elements. Since GTK+ version 3, all the rendering is done using Cairo. In June 2006 Clutter, an OpenGL-based 'interactive canvas' library, was released. Clutter has its own scene graph, and GNOME developers preferred to use Clutter's scene graph with GTK+, facilitated by a library called clutter-gtk. Clutter can be embedded into every GNOME application by using the clutter-gtk library. The clutter-gtk library provides a GtkClutterEmbed GTK+ widget which can be used to display a ClutterStage. Some thought went into how to merge Clutter and GTK+ in a better way than the clutter-gtk library. In 2011 Firefox introduced "Azure" and Joe Drew and Bas Schouten bothered with some explanations. GTK+ Scene Graph Kit (GSK) is the forthcoming scene graph (canvas) for GTK+ in the process of being written by Emanuele Bassi. Graphene is a collection of geometry types — points, sizes, rectangles, vectors, quads, quaternions, matrices. It tries to optimize them so that the naive, four floats for vertex/four vertices for matrix implementation is not the only one available. Graphene's API makes it possible to avoid exposing C arrays of floating point values, or opaque memory regions, enabling the manipulation of vectors and matrices in other languages as well. Having OpenGL (or OpenGL ES) support in GDK facilitates a slightly better control of the graphics pipeline; OpenGL is well suited for compositing textured data but totally unsuited for drawing. Before the adoption of GSK, application developers could optionally use Clutter. The way widgets were drawn in GTK+, was, that a draw function drew everything. There was no way to know, what has just been drawn. To know where the mouse pointer was currently hovering over, the current position had to be computed. With GSK, it should be fairly easy to write complex graphical control elements (widgets) and still track easily the whereabout of the mouse pointer. Getting more conformation with CSS should also arrive. The latest information about the status of GSK is from GUADEC 2016. GtkInspector has been introduced with version 3.14. GtkInspector can only be invoked after installing the development package libgtk-3-dev/gtk+-devel. Glade, supports GtkBuilder, which is a GTK+ built-in GUI description format. Crow Designer, relies on its own GuiXml format and GuiLoader library. Stetic, part of MonoDevelop, oriented towards Gtk#. GtkBuilder allows user interfaces to be designed without writing code. The interface is described in an Extensible Markup Language (XML) file, which is then loaded at runtime and the objects created automatically. The Glade Interface Designer allows creation of the user interface in a WYSIWYG manner. The description of the user interface is independent from the programming language being used. A library written in one programming language may be used in another language if bindings are written; GTK+ has a range of bindings for various languages. Gtk# is a set of .NET bindings for the GTK+ GUI toolkit and assorted GNOME libraries. The library facilitates building graphical GNOME applications using Mono or any other compliant CLR. Gtk# is an event-driven system like any other modern windowing library where every widget allows you to associate handler methods, which get called when particular events happen. Applications built using Gtk# will run on many platforms including Linux, Windows and OS X. The Mono packages for Windows include GTK+, Gtk# and a native theme to make applications look like native Windows applications. Starting with Mono 1.9, running Gtk# applications on Mac OS X no longer requires the user to run the X11 server. Glade can be used with the Glade# bindings to easily design GUI applications. A GUI designer called Stetic is integrated with the MonoDevelop IDE. In addition to support the standard GTK/GNOME stack of development tools, the gtk-dotnet.dll assembly provides a bridge to consume functionality available on the .NET stack. At this point this includes the functionality to use System.Drawing to draw on a widget. GTK+ is mainly developed by The GNOME Project, which also develops the GNOME Development Platform and the GNOME Desktop Environment. GTK+ development is loosely managed. Discussion chiefly occurs on a number of public mailing lists. GNOME developers and users gather at an annual GUADEC meeting to discuss the current state and the future direction of GNOME. GNOME incorporates standards and programs from freedesktop.org to better interoperate with other desktops. GTK+ is mainly written in C. A number of language bindings are available. On September 1, 2016 a post on the GTK development blog denoted, among other things, the future numbering scheme of GTK+. GTK+ version 3.22 from autumn 2016 shall be the last 3.x release. After that all resources will flow into the GTK+ 4 development series with the version names 3.90, 3.92, etc. Whether the numerous application that still use GTK+ 2.x, even the Wikipedia has a couple of articles on those, will be ported to 3.22 or not, only the future can show. In former times GTK+ (and GNOME, GLib, etc.) utilized the GNU Build System (called Autotools) as the build automation system of choice. The Meson build system is being prepared to be used with GTK. The most common criticism towards GTK+ is a lack of backwards-compatibility in major updates, most notably in the API and theming. The compatibility breaks between minor releases during the GTK+ 3.x development cycle has been explained by Benjamin Otte as due to strong pressures to innovate, such as providing the features modern users expect and supporting the increasingly influential Wayland (display server protocol). With the release of GTK+ 4, the pressure from the need to innovate will have been released and the balance between stability and innovation will tip towards stability. Similarly, recent changes to theming are specifically intended to improve and stabilise that part of the API, meaning some investment now should be rewarded later. Dirk Hohndel, co-developer of Subsurface and member of Intel's Open-Source Technology Center, criticized the GTK+ developers for being abrasive and ignoring most community requests. Hong Jen Yee, developer of LXDE, expressed disdain for version 3 of the GTK+ toolkit's radical API changes and increased memory usage, and ported PCManFM to Qt additionally. PCManFM is being developed with a GTK+ and with a Qt at the same time. The Audacious music player plans to move back to GTK+ version 2 starting with version 3.6, with the long-term goal of migrating to Qt. The reasons stated by the developers for this include a transition to client-side window decorations, which they claim cause the application to look "GNOME-y and out of place." Wireshark also is transitioning to use Qt due to not having a good experience with its cross-platform support. Screenshot of GIMP 2.4. GTK+ is responsible for managing the interface components of the program, including the menus, buttons, and input fields. GNOME Core Applications – as part of GNOME desktop environment, developed in concert with GTK+ itself. 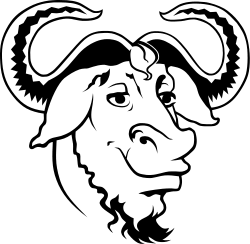 GNU Emacs can use GTK when running under X.
gconfig – Linux kernel source configuration utility. Geany – a lightweight cross-platform IDE and GTK+ text editor based on Scintilla. Several desktop environments utilize GTK+ as the widget toolkit. GTK+ programs can run on top of X11-based desktop environments or window managers even those not made with GTK+, provided the required libraries are installed; this includes Mac OS X if X11.app is installed. GTK+ can also run under Microsoft Windows, where it is used by some popular cross-platform applications like Pidgin and GIMP. wxWidgets, a cross-platform GUI toolkit, uses GTK+ for GNU/Linux operating systems. Other ports include DirectFB (used by the Debian installer, for example) and ncurses. The following code presents a graphical GTK+ hello-world program in the C programming language. This program has a window with the title "Hello, world!" and a label with similar text. GTK+ was originally designed and used in the GNU Image Manipulation Program (GIMP) as a replacement of the Motif toolkit; at some point Peter Mattis became disenchanted with Motif and began to write his own GUI toolkit called the GIMP toolkit and had successfully replaced Motif by the 0.60 release of GIMP. Finally GTK was re-written to be object-oriented and was renamed GTK+. This was first used in the 0.99 release of GIMP. GTK+ was subsequently adopted for maintenance by the GNOME Foundation, which uses it in the GNOME desktop environment. The GTK+ 2.0.0 release series introduced new features which include improved text rendering using Pango, a new theme engine, improved accessibility using the Accessibility Toolkit, transition to Unicode using UTF-8 strings, and a more flexible API. Starting with version 2.8, GTK+ 2 depends on the Cairo graphics library for rendering vector graphics. GTK+ version 3.0.0 included revised input device handling, support for themes written with CSS-like syntax, and the ability to receive information about other opened GTK+ applications. 2004-12-16 New widgets (GtkIconView, GtkAboutDialog, GtkCellView). 2009-03-13 New widget (GtkOrientable), Caps Lock warning in password entry. 2009-09-23 New widget (GtkInfoBar). Improvement on file chooser, printing. 2011-02-10 Development and design of the GTK+ 3 release of the toolkit started in February 2009 during the GTK+ Theming Hackfest held in Dublin. The first draft of the development roadmap was released on 9 April 2009.
completed mostly Project Ridley, the attempt to consolidate several libraries that were external to GTK+, including libgnome, libgnomeui, libgnomeprint22, libgnomeprintui22, libglade, libgnomecanvas, libegg, libeel, gtkglext, and libsexy. GtkScrolledWindow will do kinetic scrolling with touch devices, OS X support has been improved. This is the first version of GTK+ 3 that works well on Windows. Spin buttons have received a new look. 2012-09-24 GtkSearchEntry, GtkMenuButton, GtkLevelBar. Vertical spin buttons. 2013-09-23 New widgets (GtkHeaderBar, GtkPlacesSidebar, GtkStack, GtkStackSwitcher, GtkRevealer, GtkSearchBar, GtkListBox). Added: client-side decorations, scaled output support on high-dpi screens, fine-adjustment mode for scrolling. Tear-off menu-items, plus a number of GTK+ settings. GSK (GTK+ Scene Graph Kit not merged! The GNOME team releases new versions on a regular basis. ↑ "The GTK+ Open Source Project on Ohloh". Ohloh.net. Retrieved 2014-02-17. ↑ The GTK+ Team. "GTK+ Features". Retrieved 8 September 2014. ↑ "GTK+ to Use Cairo Vector Engine". Retrieved 2009-12-27. ↑ "Introducing the Azure project". 2011-04-26. ↑ "Comparing Performance: Azure vs Cairo". 2011-06-06. ↑ "The GTK+ Scene Graph Kit". 2014-07-29. ↑ "2014 Developer Experience Hackfest: A scene graph for GTK+ 3.16". 1 2 "GNOME Wiki: roadmap for GTK+". ↑ "GTK Scene Kit Merged For GTK4 (Phoronix)". 2016-10-18. ↑ "Another GtkInspector update". 2014-07-11. ↑ "nothing-personal - A development site for Crow Designer, GuiLoader and Rally - Google Project Hosting". Retrieved 2014-02-17. ↑ "Download [Gtk#]". The GTK+ Project. ↑ "GNOME Quick SWOT Analysis". The GNOME Project. Retrieved March 18, 2014. ↑ "GTK+ and GNOME Mailing Lists". The GNOME Project. Retrieved December 4, 2011. ↑ "About". GUADEC. Retrieved December 3, 2011. ↑ "GNOME Languages". Ohloh. Black Duck Software. Retrieved May 22, 2014. 1 2 "Versioning and long term stability promise in GTK+". GTK development blog. 2016-09-01. 1 2 "GUADEC2013: Benjamin Otte talks about GTK+". GUADEC. ↑ Larabel, Michael (2014-01-12). "The Biggest Problem With GTK & What Qt Does Good". Phoronix. Retrieved 2014-09-10. ↑ Hong Jen Yee (2013-03-26). "PCManFM Qt 0.1.0 released". Retrieved 2014-09-10. ↑ Web Upd8 (2014-06-23). "Audacious Going Back To GTK2 Starting With Version 3.6". Retrieved 2014-10-21. ↑ Lindgren, John (2014-05-06). "Ugly window decorations and how to fix them (GTK+ 3.12)". Retrieved 2014-10-21. ↑ Gerald Combs (2013-10-15). "We're switching to Qt.". Retrieved 2015-08-19. ↑ "GTK+". WxWidgets Compared To Other Toolkits. ↑ "GTK+ TTY Port". Slashdot. Retrieved 2010-08-31. ↑ "What is the + in GTK+?". 2011. Archived from the original on 2012-03-26. Retrieved 2014-03-18. ↑ "GTK 3.12 introduced client-side decorations". ↑ Matthias Clasen (2014-05-15). "GtkInspector Author's blog entry". Retrieved 2014-05-17. ↑ "GtkInspector in GNOME wiki". 2014-05-15. Retrieved 2014-05-17. ↑ "Merging gestures into 3.14". 2014-05-23. Retrieved 2014-05-23. ↑ "RFC: gestures". 2014-03-04. Retrieved 2014-05-23. ↑ "GTK+ 3.20 – Style Classes and Element Names". 2015-11-20. ↑ "GTK+ Wayland tablet support merged". ↑ "libinput as of September 2016". 1 2 "Gtk 4.0 will not be stable until Gtk 4.6". 2016-06-13. 1 2 "Gtk 5.0 will not be stable until Gtk 5.6". 2016-06-14.